Image courtesy of Victoria D.
Las Vegas is a popular vacation spot because it offers a variety of entertainment for everyone. Whether you want to spend your time at the pool, catch as many shows as possible, or make side trips to the Grand Canyon, Vegas can satisfy all interests. Las Vegas weather will beckon you to go play outside. With more than 300 days of sunshine every year, the odds that the weather will be good are in your favor. The average highs range in the 50s and 60s for the winter and up to the 90s and 100s in the middle of summer with 100% fun all year round! Peak months to visit Las Vegas are in spring and early fall to catch the most moderate weather. There are a few ways to move around on the Las Vegas Strip: by foot, bus, monorail, shuttle or taxicab. Walking is the most popular means of traveling especially around the Strip. There are also taxis available to make your travel easy and cheap. Most hotels will offer taxi services; just ask at the front desk where you can catch transportation to your destination. The best time to visit Las Vegas is during the week when hotel prices are significantly lower than on the weekend. Most hotels offer packages, some including meals, casino credits, or show tickets. Hotels directly on the strip tend to be more expensive but are closer to the action. No matter when you go, though, you should be able to find a great deal on a hotel in Vegas, and you probably won't be spending much time in your room anyway with all the fun things to do! For great places to stay, visit here. Palms Pool - Located at the Palms Casino Resort, this is an outdoor playground featuring two acres of swimming pools. Up to 3,000 guests can enjoy the pool, live concerts, DJs and 27 Cabanas. Rehab pool - Located in Hard Rock Hotel, Rehab is one of the destination areas of Las Vegas. Known for Sunday daytime events, Rehab is sure to be your cool down spot. TAO Beach - Located in The Venetian, this outdoor oasis featuring 40-foot tall bamboo trees transports visitors to a Balinese escape. Bellagio Fountains - A must-see attraction. With shows every half hour, the Fountains provide a water show to opera, classical and Broadway tunes that will "romance your senses". Shopping: Caesar's Palace is a great place for all-around shopping! Come discover the treasures of the Roman Empire with some of the world's best designers of men's and women's fashion, accessories, furnishings, dining and so much more. From Jimmy Choo to Louis Vuitton you will not be disappointed. For more shopping options, visit here. Las Vegas Boulevard: This is a major road in Las Vegas Valley of Nevada, best known for the Las Vegas Strip and its casinos. The boulevard serves mainly local traffic and runs the length of the Las Vegas metropolitan area. As the Boulevard leaves the city of Las Vegas at Sahara Avenue it assumes its unofficial name the Las Vegas Strip for the next four miles. If you are on a budget, you can spend a lot of time on the Strip just going in and out of all of the hotels—each has a different theme, attractions, shopping, casinos, and dining options that can meet a variety of budgets. And at the end of the strip you will find the famous "Welcome to Fabulous Las Vegas" sign. Gambling: You must be 21 years of age to gamble in a casino in Vegas. Some casinos will let you walk through to your destination if you are younger than 21. Try your hand at a few games! Old Las Vegas: If you're interested in "Old Vegas", take a walk through Fremont Street. Here you will find old hotels like the Goldengate, the oldest, circa 1906 as well as Fremont Street casinos such as the Golden Nugget or Binion's. Interested in some classic Vegas entertainment? Check out the long time running production Jubilee! Stratosphere: Strap into the Big Shot and prepare to be shot 160 feet in the air at 45 miles per hour as you overlook the Las Vegas Valley. You will be catapulted from the 921-foot high platform to a height of 1,081 feet and down again. Experience a gut-wrenching four Gs of force on the way up, and feel negative Gs on the way down as your legs dangle in the Las Vegas skyline. New York New York Roller Coaster: The Roller Coaster will lift you up 203 feet, drop you down 144 feet and leave you coasting at 67 mph. This Las Vegas ride experience simulates a jet fighter's barrel roll while taking you on the famous "heartline" twist. Individual tickets cost $14. 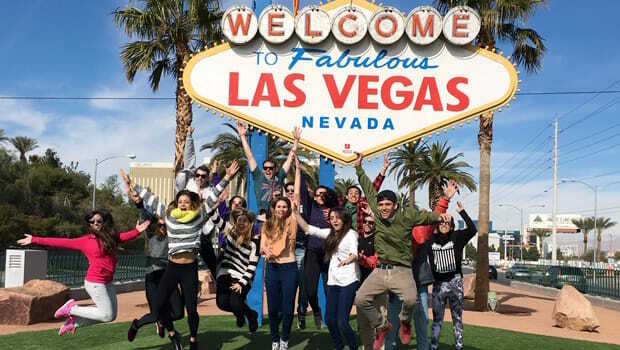 Additional Attractions: Vegas offers many adventure for all ages and interests alike! Bodies The Exhibit is just one option available. For more, start here. Buffets are a great way to have a filling meal and can make the most of your money. The Bellagio offers a great buffet all day long with prices ranging from $15.95 to $29.95 depending on the time of day you go. Another talked about buffet is at the Wynn Las Vegas with prices similar to the Bellagio. You can even get a Champagne Brunch buffet for $41.95 as well if the feeling hits! Check out the hotels around you for their brunch information. If you're looking for a more upscale dining experience, though, Vegas has many options to meet your interests. Alize is located at 4321 W. Flamingo Rd and is notably ranked as one of the 5 highest restaurants in North America, being on the 56th floor of the Palms Casino & Resort. The French cuisine and world-renowned wine cellar and cognac collection is sure to please any diner for a special occasion or just a night on the town. Andre's at the Monte Carlo has been given Best Restaurant honors from Michelin, Zagat, Conde Nast, Triple A and Frommer's. This French restaurant has customers leaving night after night with rave reviews and a satisfied palate. Il Mulino New York located at 3570 Las Vegas Blvd South has been pleasing guests for more than 20 years with their Italian cuisine. Chef and founders Fernando and Gino Masci were born and raised in Abruzzo, Italy and have the ability to transport you to another world while dining in their exquisite restaurant. Bar Masa located in Aria Resort & Casino has been known as an unrivaled Japanese restaurant. This legendary hot spot offers two separate dining spaces with an option to sample your choice of modern Japanese food from an a la carte menu. Come enjoy the intimate and serene atmosphere while enjoying the purity of Masa's cuisine. Bartolotta Ristorante di Mare is located in Encore Hotel & Casino at the Wynn . You can dine indoors with rich décor or outside in private cabanas surrounding a lagoon. This 2012 Forbes Four Star Award winner features fresh Mediterranean seafood that is sure to please! Joel Robuchon Restaurant at the MGM Grand is known to have redefined Las Vegas fine dining. Joel Robuchon was named France's Chef of the Century by the esteemed Gault Millau restaurant guide. Reservations are recommended for this hot spot and the menu offers tasting menus or a la carte catering to your preference. TAO: Located at The Venetian Resort Hotel Casino at 3355 Las Vegas Blvd. South. At this hotspot you will find a 20-foot tall Buddha statue, an infinity pool filled with Koi fish, eight private skyboxes with mini bars and a 40-foot long outside terrace with views of the strip. LAVO: Located in The Palazzo, LAVO overlooks The Strip, affording one of the best views in all of Las Vegas. LAVO nightclub offers one of the most intimate yet energetic dance floors in Las Vegas. LAVO is deemed a "must-go" for those who love great food, music and dancing. Pure is claimed to be one of the most beautiful clubs in the world and has even been dubbed "Las Vegas Mega-Club of the year". The establishment offers three venues in one, each featuring a different DJ, sound system and style to accommodate everyone's taste. Vanity: Located at the Hard Rock Hotel & Casino at 4455 Paradise Road, Vanity offers you an upscale nightlife adorned with pearls and hand cut crystals surrounded with antique mirrors, velvets and deep satins. The 14,000 square foot venue offers 60 VIP booths and a terrace overlooking Hard Rock Beach Club. Shows: Las Vegas is known to have the widest selection of shows to make any member of the group or family excited. The shows range in interest as well as cost. Check out the shows playing and see what interests you. The 6 top-selling shows currently playing in Las Vegas are: Viva Elvis Cirque Du Soleil, Blue Man Group, Variety Show, Terry Fator, Absinthe and Le Reve. You can check out ticket pricing online here. Grand Canyon: Named one of the Seven Wonders of the World, this mile deep canyon is visited by nearly 5 million people each year. The South Rim is the most accessible part of the park and is open all year. Stop by the Grand Canyon for some breath taking views! Hoover Dam: This Dam is the highest concrete dam in the Western Hemisphere, and it is located in the Black Canyon of the Colorado River on the border between Arizona and Nevada. Its popularity not only comes from the fact that it was constructed between 1931 and 1936 during the Great Depression but also for its unique views. Stop by for a tour during your trip! If you know of some great areas or attractions that we've missed, please leave comments and suggestions along with your tips on navigating the city!